In a world overtaken by darkness, a dwindling group surviving the invasion from the Nameless creatures years ago is all that remains of humanity. The underground city of Gravehold is the last beacon of hope as some of the survivors learned to harness the power of the breaches that brought the Nameless creatures. Using energy from various gems, they have transformed it into spells and weapons that they can use fight the Nameless. These skillful survivors are called Breach Mages, and they are the only ones who can push back the darkness and take back the world. 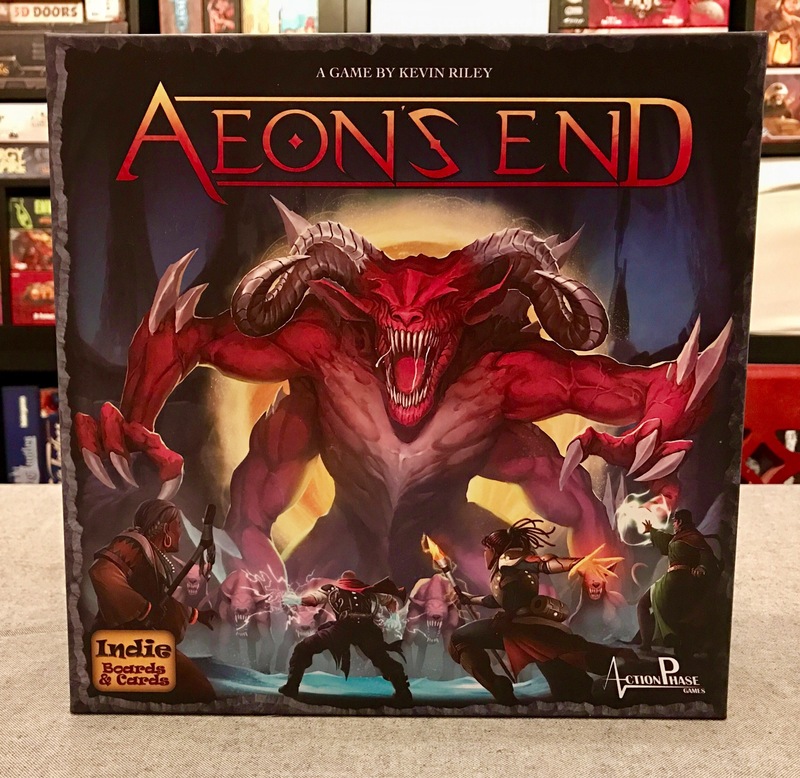 Aeon’s End is a cooperative, deck-building game that has players taking on the role of a Breach Mage to protect the last human settlement of Gravehold. The player’s main goal is to destroy the Nameless creature attacking Gravehold before they can annihilate the city. To do this the Breach Mages will need to harness energy from the breaches and transform them into deadly spells. Each mage will have their own ability and starting gem/spell that sets them apart from other Breach Mages. Players will acquire gems, relics, and spells to aid defense throughout the game. The mages will need to have a plan to defend Gravehold as the Nameless will use everything at their disposal to crush the life out of the last remaining human. Can you and your fellow Breach Mages protect Gravehold from the Nameless? In Aeon’s End, players will first select their Breach Mage and take the corresponding player mat, starter cards, ten life tokens, and a player number token. The player token will aid in remembering when it is your turn, as they are randomized through a turn order deck. A nemesis (Nameless creature) will be selected to play against. Each nemesis will have its own unique skill set to destroy Gravehold so players will have to adjust their strategies to succeed. Lastly, players will set up the supply of cards available to purchase. The first card of the turn order deck will be revealed and the game will begin. If multiple spells were prepped, they can be cast in any order. Once cast, place on top of discard pile. When a minion or nemesis is damaged, it will reduce their life by the amount of damage done by the spell. If a minion reaches zero life, they are defeated and placed into the nemesis deck discard pile. If the nemesis reaches zero life, players win the game. Play a gem or relic card: Players will play gems to gain aether or relics to perform special actions. Aether can only be used on the current turn that the gem was played, any remaining aether that isn’t spent will be lost. Gain a card: Aether gained this turn can be spent to purchase cards from the supply. Any cards gained this turn will be placed on top of the discard pile. Gain a charge: Players can spend two aether to gain one charge for their special ability. Charges will be consumed and placed back into the supply when the mage’s special ability is performed. Focus a breach: Aether can be spent to “focus” any breach, which will bring them one step closer to fully opening the breach. Open a breach: Players can skip focusing their breaches and spent extra aether to immediately open one of their breaches. Prep a spell to a breach: Each open breach can have one spell prepared on it to be cast on the player’s next “Casting Phase.” Breaches that were focused on the current turn can also have a spell prepared on them. Resolve a “While prepped” effect: Some spells will give players a special effect that can be resolved during the phase indicated on the card. Each spell’s effect can only be used once per turn. Resolve a “TO DISCARD” effect: Some Nemesis cards will have a “TO DISCARD” effect that players can perform to prevent a Nemesis power card from activating. If the deck does not have enough cards for the player to get a full hand of five cards then they will flip over their discard pile to form their deck. The player’s deck will never be shuffled so the order that cards are discarded in is important for setting up combos. From oldest to newest, resolve the effects of each minion and power card currently in play. Draw a card from the nemesis deck. If it is an attack card, resolve immediately and discard. If it is a minion or power card, place it into play. Perform any effects following “IMMEDIATELY” on the card. If a player reaches zero life they are considered exhausted. In this weakened state, they lose access to one of their breaches and are unable to heal wounds. They will continue taking turns normally, but if they are supposed to suffer any damage, twice that amount of damage is dealt to Gravehold. The game will continue until the players win the game by defeating the nemesis or if the nemesis has no cards left in its deck and no cards left in play. Alternatively, the nemesis will win if all players have zero life or if Gravehold has zero life. In our second review of 2017, we have another game that we had backed on Kickstarter last year. The good news is that there were no Kickstarter exclusives with Aeon’s End, and the base game and one of the expansions that came with the Kickstarter are currently available for purchase. This game really stood out to me because it is a co-op deck building game, and it doesn’t require you to shuffle your deck constantly. The artwork also looked pretty cool with a take on a post-apocalyptic fantasy world being besieged by monsters. The few tweaks made to the deck building mechanic feel unique and it is a good addition to our collection. The difficulty level of this game feels just right. Every game that we’ve played has come down to the draw of the turn order deck. It’s a pretty tense feeling as you watch that card flip over knowing that any player card will win you the game, but a Nemesis card would lead to the destruction of Gravehold. Sometimes luck would be on your side and other times you could get a string of bad luck, like the Nemesis getting two turns in a row. In fact, losing to the Nemesis while getting so close only made us want to play another game with the same setup to see if we could come up with a winning strategy. A big thing that we learned after playing against three different nemeses is that each one requires a different strategy to defeat them. The nemeses we played against after Rageborne required us to come up with a good strategy that had each of us focusing on a certain type of card or target. For example, in the game that we beat the Carapace Queen, I was focusing on preventing the number of husks from getting too high using weaker spells while Mandee bought higher damaging spells and focused on the boss. Whereas in our games against Rageborne, we didn’t really need to coordinate much because we could both focus on getting a good resource engine going and dealing damage to the nemesis. Aeon’s End comes with four nemeses in the retail box, and each one of them has a unique ability and unique cards that get added to the Nemesis Deck. So far, we’ve played against Rageborne, Carapace Queen, and the Blight Lord (from the Nameless expansion), and each of them have created a unique experience. Rageborne, being the introductory boss, helps you quickly discover that you will loathe seeing the word “Unleash” on a nemesis card. With the Carapace Queen, you’ll experience how strong a double nemesis turn order draw can be too, especially if there are power cards in play. The Queen has an army of husks at her disposal that allows her to perform devastating swarm attacks if her husk population isn’t kept in check, and it forces you to decide if the best use of your spells is to destroy husks or directly attack her. In our one game against the Blight Lord, it felt like a race to defeat him because of his tainted track. His special ability clogs up your deck with tainted gems that require you to spent aether to get rid of. So you’ll have to contend with getting those gems out of your hand and also defeat him before his token reaches the end of his tainted track. Each nemesis also adds unique cards to the nemesis deck as well that complements their special ability. So even though there are only four Nemeses in the base box, that should be more than enough to keep you busy for a while. Especially with six different breach mages to try and a lot of different market card combinations you can try out. Trying out all the different combinations of mages and nemesis matchups gives you a good amount of replayability. The designer, Kevin Riley, has also been posting challenging custom scenarios that players can try out too that will add a slight twist to the core mechanics and force players to take a different approach to winning the game. There’s currently six of these challenges posted in the “Varients” section of the Aeon’s End BGG page located here. Once we get a couple more games under our belt I’d definitely like to give a couple of these a try. Aeon’s End adds a couple twists to the deck building formula that made the game a bit more enjoyable to me than other games with the same mechanic. Not having to shuffle my discard pile every time to form my new deck is awesome and gives me that feeling of having more control over trying to set up combos with my cards. That little choice of the order I want to discard things is a nice addition that gives you a small decision to think about at the end of your turns. It does take a little getting used to and there have been a good amount of times where either Mandee or I would forget this and would shuffle up our decks by accident. The turn order deck is an interesting mechanic that I haven’t seen before. I’m not usually a huge fan of randomness in games, but I felt like this turn order deck is a nice addition to a deck building game as it keeps you on your toes and makes you adjust your turn on the fly. You’ll have to make sure that you come up with an alternative plan if the turn order deck doesn’t come out in a favorable way. The deck could also be a big game changer if the Nemesis gets a double turn, which is pretty brutal if there are some power cards currently in play. There’s also that nice feeling of suspense as you flip over that next turn order card that could be the difference between victory and defeat. The one thing that I wish there was more of in this game is more cards that allow you to assist other people. There are some spells that allow you to cast other player’s prepared spells and some power cards that allow players to all contribute to the requirements to discard it. There are some pretty difficult power cards to discard that can only be performed by one player(like paying eight aether) during their main phase. Since you’re all fighting against the same Nemesis, I wish that any players could contribute to any of the power cards even if it isn’t their turn. This would require the power card requirements to be tweaked and varied based on the number of players, but it would give you more of that working as a team feeling to overcome obstacles. Aeon’s End continues the trend of awesome games we’ve played this year. It is very enjoyable because of the unique experience it provides by making a couple tweaks to the deck building formula. The no shuffling of your deck and turn order deck are pretty great and made the game feel different from other deck builders. Each Nemesis provides a very unique experience and being able to increase the difficulty level of each them adds a ton of replayability. This is definitely one of the best deck builders I’ve played and I would highly recommend it to anyone looking for a fun, engaging game with a lot of choices. Deck builders are becoming more and more popular, and each one has an element that makes it unique and stand out.From the most simple ones like Dominion to the more unique ones like Clank, Aeon’s End is another unique deck builder to add to our collection. One of the major elements of a game that Calvin and I look for is replayability. Typically in a deck builder, the replayability primarily comes from the variety of cards you can purchase for your deck, which this game does have. However, in Aeon’s End, the replayability is enhanced with the number of different characters you can play as and the variety of nemeses to battle. Each character you play has a special ability you can use once you have enough charges. These add a lot of variety to the game, and can really help with accomplishing the mission of killing off the nemesis. I will say that I initially thought once you had it fully charged, you could use it whenever you wanted, but that is definitely not the case. But this is actually a good thing because that would be incredibly overpowered. Then for the nemeses, there are four in the base box, and three more in the expansions. Each of them make every game unique and fun. We’ve played against three of the nemeses, and have found that they are all fairly challenging. The game requires a good blend of cooperative play mixed with individual strategy. For example, when we played against Carapace Queen, we died the first game because we didn’t plan and coordinate with each other very well. We were both focused on killing off the husks, and we never attacked the Carapace Queen. Many of our recent games we’ve purchased are deck builders, so it seems like we’ve been playing these types of games more frequently. One issue I often have with deck builders is that they can be a little redundant. It often feels like I’m doing the same thing so it can get boring after awhile. With Aeon’s End, the co-op element mixed with some unique game mechanics makes the game a little more unique than your standard deck builder. There are cooperative deck builders out there, but this one adds in a different player turn order with randomly drawn cards. Although it’s not a unique method, it is one of the first times I’ve seen it used successfully in a deck builder. Aeon’s End does something unique with these elements, which does hold my interest, but, ultimately, it is still a deck builder. My main issue with deck builders is that you often feel like every turn is the same. You draw your cards, attack, and buy a new card. So it gets repetitive and I get bored. However, as I said before, the different elements this game adds like the charges, player turn order, and not having to shuffle your deck does make it a bit more interesting. And there are a few more decisions that need to be made during your turn. Do we attack the main boss or risk going after a smaller minion? There were a few times where we made the wrong call and ended up losing because the nemesis turn occurred sooner than we were hoping for. My last thought on this is about the theme – I know it’s there, but I don’t think it is as strong as I’d like. It feels as if some elements of the game are not as integrated into the theme as they could be. The health of Gravehold was not something I kept at the forefront of my mind. During many of our games, it felt like Gravehold was completely defenseless without us. It would have been nice if Gravehold was integrated more into the game. It doesn’t seem like it has much stake in the game, except when you get really close to zero. And though I think the artwork is pretty nice and does add to the theme, I think that Aeon’s End has some poor components. The cards feel thin and I wish the breaches were made out of cardboard instead of cardstock. Ultimately, I did like this game. It was fun and it had some unique elements that made it interesting. However, this game has made me realize that maybe deck builders just aren’t my type of game. I like them, yes, but they aren’t my first choice of game. I like games with a bit more direction, and where I feel like every turn/action is important. With other games, it doesn’t feel like I’m doing the same thing over and over, but with deck builders, I do feel that way. He gives this game out of 8.5 Breach Mages out of 10. She gives this game 7 Breaches out of 10.